ownCloud made another astonishing release! Server version 8.2 contains many improvements, both regarding the design and also underneath the hood. It’s faster, better looking, and easier to use. One major improvement is the right sidebar. 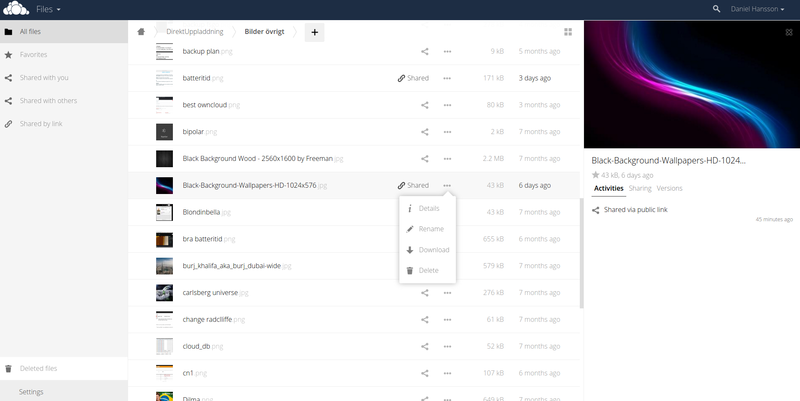 ownCloud now fits all the activities, sharing, and version into the right sidebar, so instead of having all of that information in a menu that is on the same row as the file everything is now stored in the same place – to the right. We think this is a very nice improvement that makes the usability even better than before. When we first tried to upgrade to 8.2 trough the OpenSuse repositories it didn’t work. It was like ownCloud didn’t release the new files. That was until we found out that ownCloud had changed the location of the repositories to their own server. So instead of using OpenSuse, they now have all the files here instead. To upgrade through the new repositories you have to delete the old one. The old pictures app got a really big, and needed upgrade. @oparoz has worked really hard to make this version the best one yet. And there is still more to come in the upcoming versions. Here is an ongoing discussion regarding how the new slideshow will look, please add your opinion as well. This means that the old Pictures app is gone, and replaced with the brand new Gallery app. It still has the same name in the /apps folder inside ownCloud, and if you are using Gallery+, you need to deactivate the app first, and then update. We wrote about it in this post. In the next version of our VM you can expect APCu to be gone, and replaced with the much better Redis caching instead. <– This is done. We will work on both a fix on the VM and also a guide on how to set it up on Ubuntu, as the version that is shipped with Ubuntu is a very old one, and not recommended by the ownCloud Devs. So keep coming back to Tech and Me for another update, it will be soon. Of course, we made some improvements to the VM as well. We have got many questions on how to enable the experimental apps, so we decided to enable them from start. Remember that the experimental apps are unstable, and could harm your system, so use them with that in mind, and a good idea is always to test that the app works on another system before you go live on your production system. We also updated a bug with the locales. A few updates ago on our own system we noticed that LC_ALL was missing and resulted in a nasty verbose output. We added the missing locale and reconfigured it with DPKG so now that bug is gone. Another improvement we made was to update the ownCloud update script. As we’re kind of lazy, we want as much as possible to be automated, and in the old script you always had to change the settings in .htaccess to make the increase file size work as the changes are made in the php.ini file. So now the update script will check if the value are correct, and of not, change it so that you won’t have to take the extra measures of updating .htaccess every time ownCloud releases a new version. The script also checks if the set-secure-permissions-script exists to set secure permissions after every update, and if not, it will download it so that your ownCloud installation always is secure! That’s all for now, we really hope you enjoy the new version. And keep coming back to Tech and Me for further updates regarding ownCloud and easy guides on how to make things better. The ownCloud pre-configured VM is now updated with Redis Memcache which is the recommended memcached to be used with Transactional File locking. We will write a guide soon on how you can get it if you are not using Redis today. It turns out that Ubuntu comes with 2.2.4, which is a very old version, but anyway – it’s working, and the minimum recommended Redis memcache for ownCloud is 2.2.5 so it should be fine to use 2.2.7 which we installed. We also added phpMyadmin for easier administration of the MySQL database. We also made it a bit more secure, using a regular user to access the database instead of using root. The VM is made from scratch which saved around 500 MB in space. So now it’s all good, and we will of course continue to improve it further in future releases. Enjoy!